Magazines think they’re doing us a favor by producing double issues, but on our forums, we only think of it as another whole month we have to wait for the next cover reveal. The August 2015 edition of Harper’s Bazaar dropped earlier today featuring a beautiful and radiant Natalie Portman, who suddenly feels like a refreshing cover subject for the American title. 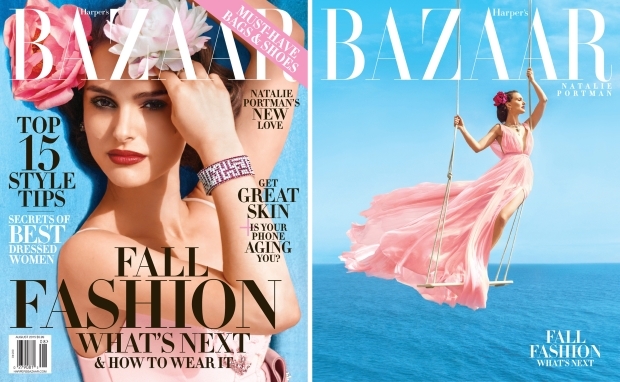 The Norman Jean Roy shoot certainly feels like a breath of fresh air as the actress warms her skin under natural sunlight wearing a pink Prada number on the newsstand cover (left), while showcasing a full-length gown on the cover for subscribers (right). Forum members immediately began to sing Bazaar‘s praises. “Stunning! Best Bazaar covers this year,” zoom announced right away. “This is all I expect from Bazaar. Easy, simple, glamour. Give me lovely looking girls and settings and I’ll forgive them for no longer producing iconic work,” added A.D.C. “It’s lovely, but what sort of weird shadow is going on, in the newsstand shot?” asked tigerrouge as the attitude started to go south. Forum member honeycombchild wasn’t so forgiving, either. “The fake shadow on the newsstand is awful. Shame, could have been beautiful. The subscribers shot is a great idea but to be picky, she should have been dropped further down into the composition I feel,” he noted. “Both covers are stunning, surprisingly,” Style Savvy shared as things got back on track. Which do you prefer? Join the conversation here.